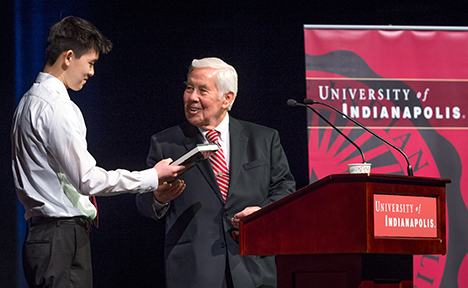 Sen. Richard Lugar presents UIndy’s $1,000 Lugar Student Leadership Award, as well as a copy of his own book, to Lawrence North High School senior Edric Zeng during Saturday’s 38th annual Lugar Symposium for Tomorrow’s Leaders. 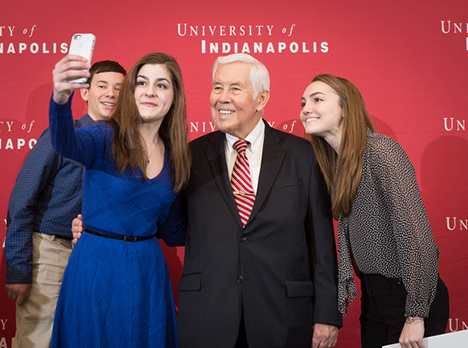 What was on longtime Senator Richard Lugar’s mind when he spoke to 450 Hoosier high school students, as well as several journalists, Saturday at UIndy? Let’s see: nuclear weapons, Ebola, Iraq, Syria, Ukraine, NATO, terrorism, oil production, climate change, the European recession and America’s “pivot to Asia,” among other topics. The setting was the 38th annual Lugar Symposium for Tomorrow’s Leaders, presented by UIndy’s Lugar Academy for about 450 select high school juniors representing more than 70 Indiana counties. 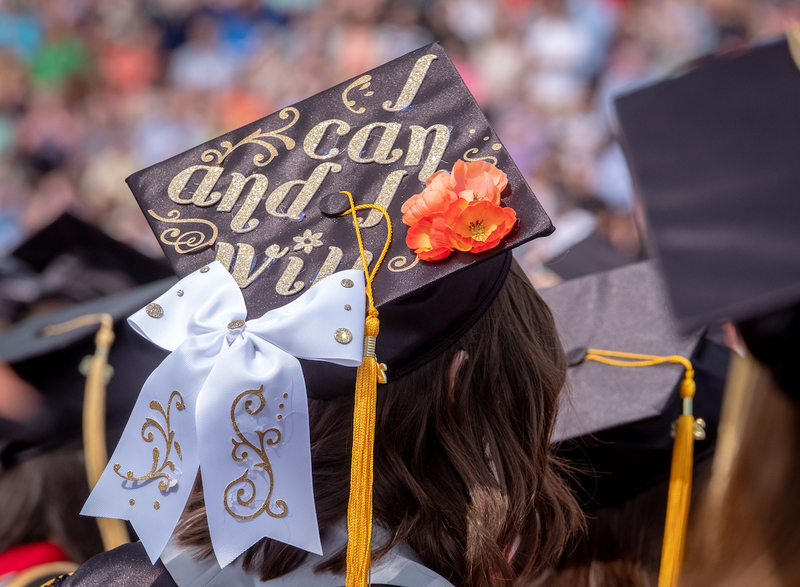 Lugar apologized in advance for the “heavy” content, but his goal, as always, was to inform bright young people about the issues facing the world and encourage them to take an active role. Discounting the notion that the United States is losing ground as a global leader, Lugar — a distinguished professor of Political Science and International Relations at UIndy — noted that the U.S. economy is undergoing a “fairly strong” economic recovery and right now is producing more oil and natural gas than any other nation, due to advances in drilling and production technology. As a result, America remains well-positioned to support political and economic freedom around the world, and has a responsibility to do so. Lugar also met with UIndy students and alumni during a Department of History & Political Science reunion lunch Saturday, a new feature introduced for this year’s symposium. During the official county-by-county photo session after the morning program, the Nobel Peace Prize nominee takes time for selfies with visiting high school students.